Samsung Mobile Philippines had a roadshow of Samsung Galaxy Note Studio last March 3-4, 2012 in Nuvali Sta.Rosa Laguna. I got an email about the event last week since It’s near my area I’ve drop by and surprisingly it was fun. The Samsung Galaxy Note Studio was set up in an open area where anyone can experience first hand the mobile phone and tablet in one. The device is connected to internet using WiFi, browsing to some webpages and social media apps. They even let me installed Mozilla Firefox mobile from the Android Market that has 14MB size, it can probably handle most apps with large file sizes with it’s 16GB internal memory and expandable external memory up to 32GB in microSD card. Games are very responsive like the fruit ninja slashing in the big screen size, wait I’m not gonna review this phone right now. A lot of people are trying out the Samsung Galaxy Note which comes in two colors, black and white version. The white looks like the Apple iPhone and I noticed it has the same normal price range at P33, 000 for the 16BG version. Wait and scout for their next tour as they offer discounts, you can have it for only P29,000 brand new of course. A feedback form is given out that also serves as a raffle coupon for a chance to win some cool prizes. So I’m hoping to win a black Samsung Galaxy Note just like anyone else. The highlight of this event is the S Pen feature that will make illustrator or graphic artist sketch, draw and paint using the stylus pen. It can output to a monitor in full resolution using HDMI cable, though having it in portrait mode do not display in full-screen. Here is my illustration/caricature I got after the long wait in line, though it’s not in color like this. the artist will be mad at me if I requested that. If you’re in the United States catch the Galaxy Note Studio Mall Tour that open on weekends until March 25, 2012 and Experience the Galaxy Note™ first-hand at select malls near you. 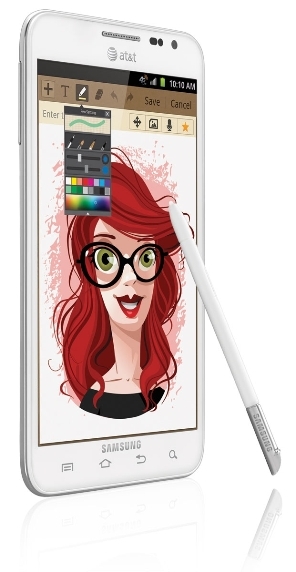 Look for our Galaxy Note Studios, where you can try out the device, get a free caricature drawn, and enter to win a Galaxy Note Accessory Pack.